Cleaning a sofa can be a simple chore, especially when you start with pre-cleaning. In fact, if you keep up with the simple pre-cleaning chores weekly, the deep upholstery cleaning will be easier when you tackle it monthly. Here are a few different ways to deep clean a sofa. Remember that you can always count on us to do this for you! We love taking care of your furniture. The first step to deep cleaning your couch is to determine what method of cleaning the couch manufacturer recommends. Check the tag attached to the couch for instructions. It’ll have a key that tells you the couch material and the acceptable cleaning products. 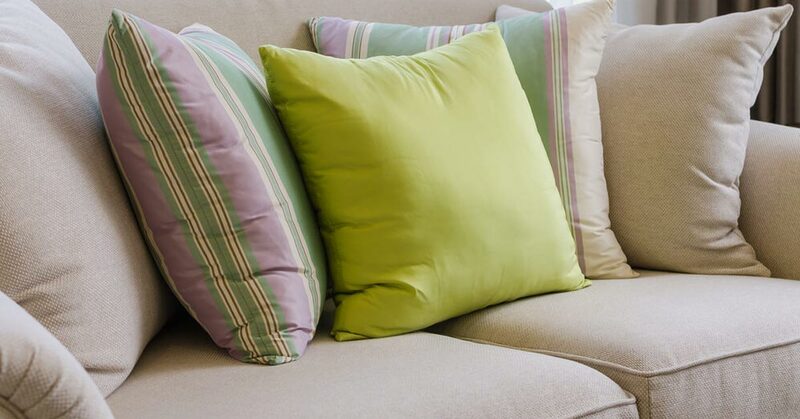 Marked by a “W” on your sofa’s tag, a fabric sofa is typically cleaned using a steam cleaner and water-based detergent. Start by pre-conditioning your sofa to loosen the dirt. (It may be wise to test any products on a spot of the couch not visible to the common eye in case it causes discoloration). Then, mix the shampoo detergent with water to create a cleaning solution to use with the steam cleaner. Pour the solution into the steam cleaner, and get to work! Using the upholstery attachment of a steam cleaner, move evenly across the surface to wash the fabric. Let the fabric dry naturally; vacuuming the wet couch will not help the fabric dry quicker. The steam equipment needed can be expensive to purchase but is usually available to rent if you don’t already have one. Or you can call us to clean your couch for you! We offer free quotes for upholstery cleaning in Casper; simply click the “Get A Speedy Fast Quote” button at the top of the page.